Old Bay Crab Cake Classic is the easy way to make delicious Maryland Crab Cakes. Crab Cake Classic® is flavor engineered to give ordinary crab meat the flavor of a classic Chesapeake Bay crab cake. 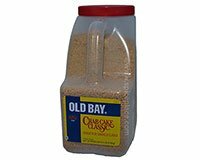 Made by the folks that make Old Bay Seasoning, the specialists in Crab Cake Seasoning. Crab Cake Classic is used to create a classic crab cake and may also be used for stuffed mushroom caps or with shrimp and lobster; use the mix as a filling for crepes or roll fish fillets in mix and bake. Tuna or salmon may be substituted for crab meat. The 5 pound bottle of Crab Cake Classic contains 20 cups of product, enough to season 40 pounds of crab meat. Gently mix in 1 pound fresh or canned crab meat. For best results, do not make crab cakes more than 3 hours in advance of cooking. †When using large lump crab meat, add 1 egg to mixture to help hold the crab cakes together. Combine 1/2 cup mayonnaise with 3/4 cup Old Bay Crab Cake Classic. Add 8 pounds crab meat, pick over and cartilage remove; toss gently. Melt 2 tablespoons butter in saucepan. While stirring, add 2 tablespoons flour over low heat; allow to lightly boil for 2 minutes. Slowly add 1 cup milk; stir constantly until thick. Combine butter sauce with crab meat mixture; place in individual shells or greased casserole. Beat 1 cup mayonnaise and 2 eggs together. Spread on top of crab mixture. Sprinkle with McCormick Paprika. Bake for 10 to 15 minutes or until bubbly and golden brown. Serve on toasted rolls or plain.